Toss zucchini with 1 teaspoon salt and let drain in colander for 30 minutes. Spread zucchini on several layers of paper towels and thoroughly blot dry. In bowl, combne softened butter, garlic, oregano, pepper flakes, ½ teaspoon salt, and ¼ teaspoon pepper. In separate bowl, season tomatoes lightly with salt and pepper. Fold and cut parchment into 8 heart shapes. Adjust oven racks to lower middle and upper middle positions and heat oven to 450 degrees. Spread parchment pieces on clean, dry counter. Neatly shingle zucchini into small pile on one side of each parchment sheet. Spoon ¼ cup tomatoes on top of each zuccini pile. Pat fish dry with paper towels, season with salt and pepper, lay on top of tomatoes. 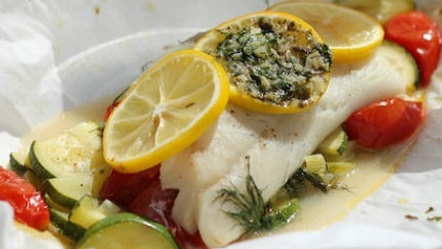 Spread 1 tablespoon butter mixture evenly over top of each piece of fish. Fold cut edges of parchment over to make tidy airtight packets. Place packets on 2 large baking sheets. Bake for 15 minutes, switching and rotating pans halfway through baking. Working quickly, cut x in top of each packet with scissors and sprinkle basil over fish. Gently transfer packets to individual plates and serve. With lemon wedges. End.